The March meeting will be at 7:00 pm on the 18th at the University of Tennessee Space institute, room H111. The March program will be given by Pete Miller, one of our club members. Pete will present a program on the art of Pyrography. It is as easy or as difficult as you want to make it. Some of our wood carvers use pyrography to burn feathers or other details onto birds and animals. Come out and here Pete’s interesting take on the topic. See you at our March meeting on the 18th. Phil Bishop remains in the Rehab section of the hospital in Winchester. Remember: the 2014 club dues were due in November, 2013. Check with Henry Davis to pay your 2014 dues. REMINDER -- Please remember to wear your new name tag at our meetings so that our new members will know who you are. The exhibition, “In the Spirit of Fine Woodworking” was held at the South Jackson Civic Center in Tullahoma March 2 through 9.
hard work went into making the event successful. It could not have happened without the help and support of a lot of members. We can’t begin to thank everyone that had a part in the exhibition. The event chairman, Loyd Ackerman, deserves a big thanks for his leadership and organization of all the activities that were required. Thanks also to all those that assisted Loyd with various “background” support. success story. They also provided refreshments for club members working or visiting during the exhibition. outlets and radio/cable stations within the area. Vince Zaccardi did his usual outstanding job of coordinating the event with the South Jackson staff. The display of all the “door prizes” created interest among the attendees. Thanks to all who donated items for the door prizes. Thanks to all the members who provided items to display and for their cooperation bringing and picking up the items. The Carvers Clinic did not meet in March. Phil being in the hospital. The net meeting will be announced at the regular club meeting on March 18. Anyone interested in carving is welcome to attend these monthly meetings. The flute circle group did not meet in February. The next scheduled meeting will be in March and the date will be announced at the regular monthly club meeting on March 18. Be “in the know” in 2014! Participate in the TVW forum. opportunity, you are missing a great chance to learn new techniques and brush up on old ones. 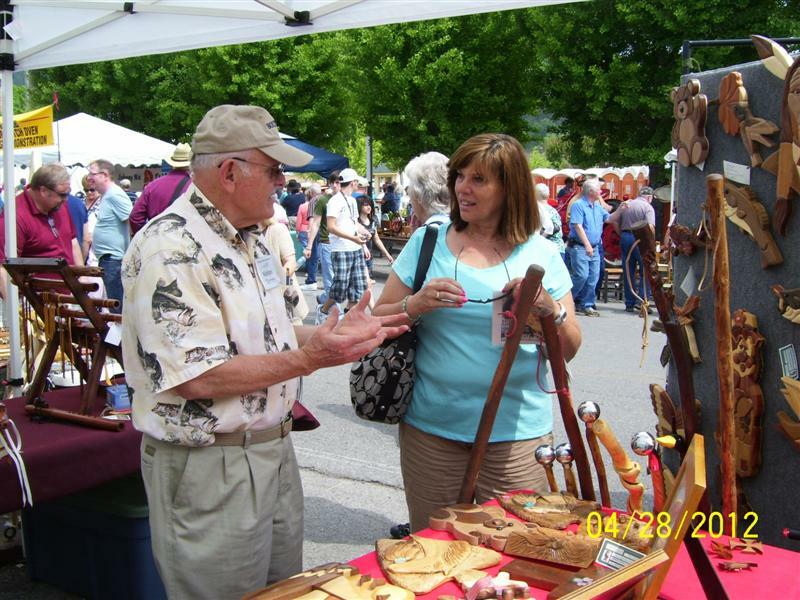 The Panoply program will be held on April 25-27 in Huntsville, Alabama. Greg Myers is the activity contact. if you can help in this activity, please contact Greg. Additional information will be available at the March meeting. 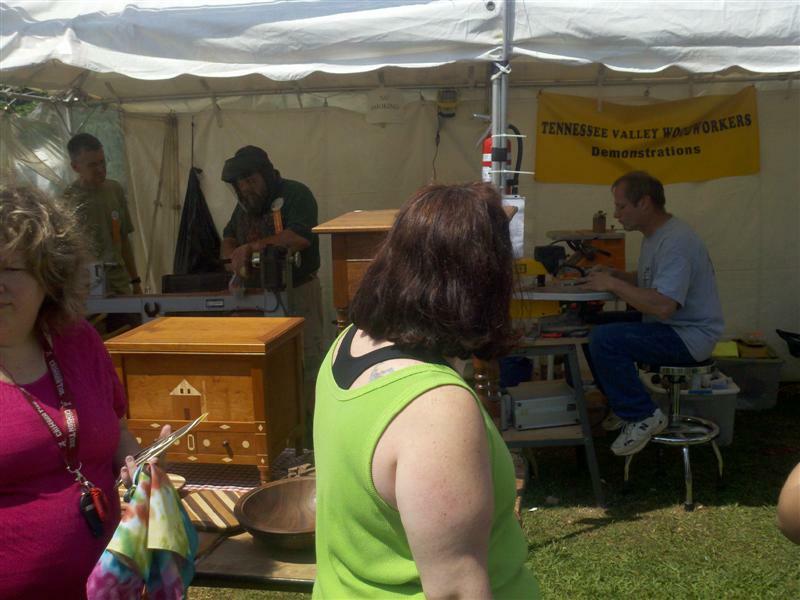 The Cornbread Festival is scheduled for April 26-27. the location is South Pittsburg. Contact Billy May if you are interested in participating in this event. 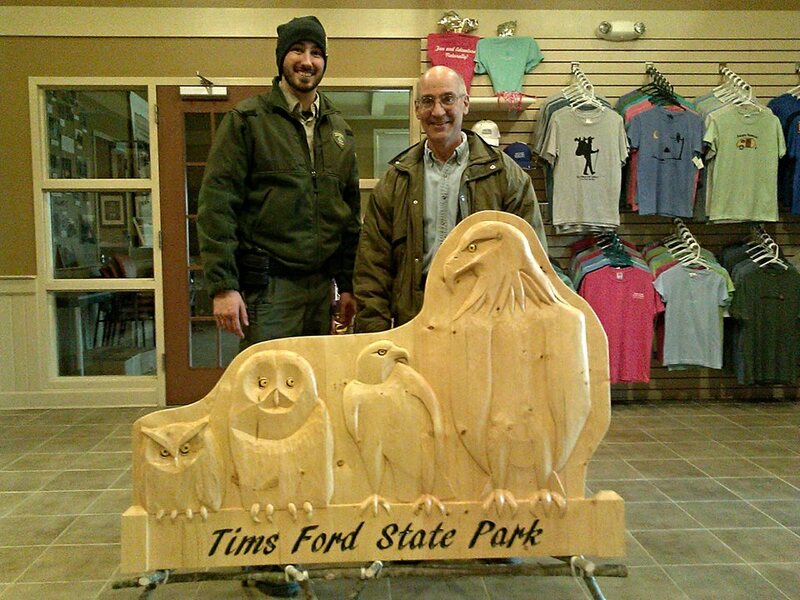 Mike Zinser – brought several off-center off-axis wall hangings that he turned from burl. After buying a barn full of the burl boards for $150, he sold the first piece he made for $250. Ross Roepke – brought a cherry table inspired by one that he saw in Fine Woodworking. veneered half-inch plywood in the design. made from walnut and maple. Celtic knots, and a Celtic dragon. He also brought a well-pump Intarsia plaque. Johnnie Brown – brought several pens and pencils that he turned and finished with CA glue. Mickey Knowles – brought two bowls that he turned from cherry. 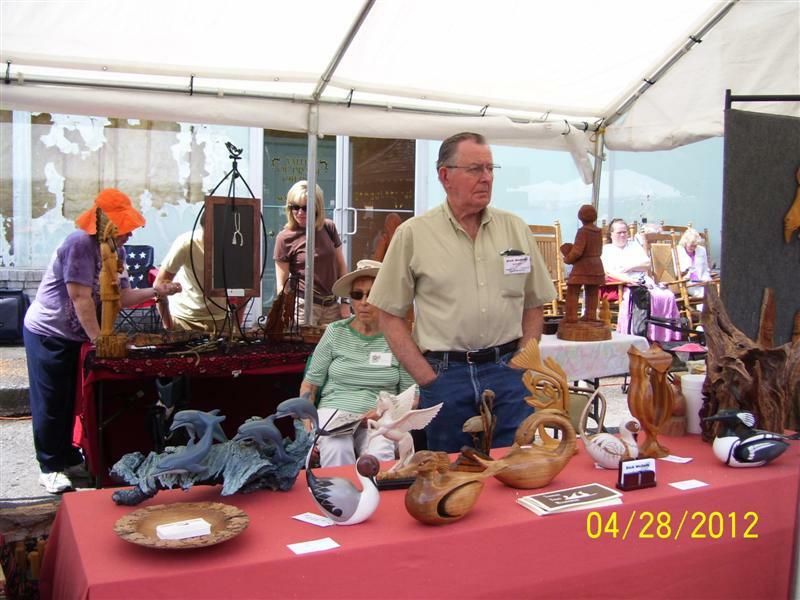 Doug Dunlap – brought a turned vessel that flew apart while turning on the lathe. Art Brickse – brought a large folding suitcase stand for Maurice Ryan. the repair. 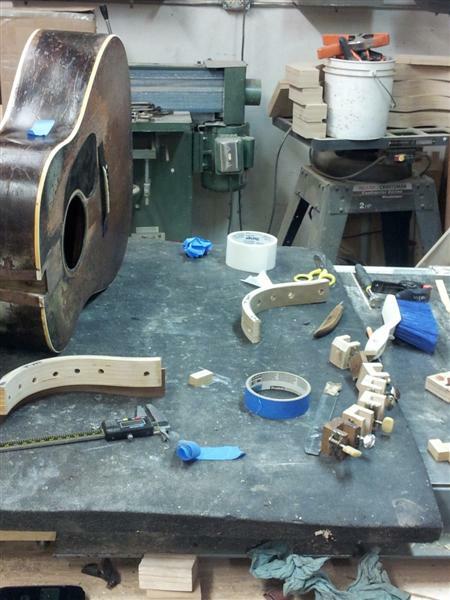 Many other photos of the repair effort are posted on the web site in the 2014 02 "show and tell" folder. one side of dead center. Make one cut, flip the work piece end-for-end, and cut the other groove side. Check the fit of the groove and adjust the fence for additional cuts, always flipping the part to cut both sides of the groove. 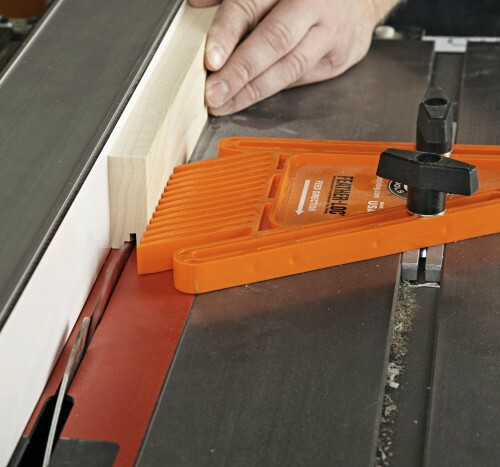 Use a feather-board to ensure consistent cuts, and always test your setup in scrap before cutting the actual work pieces. 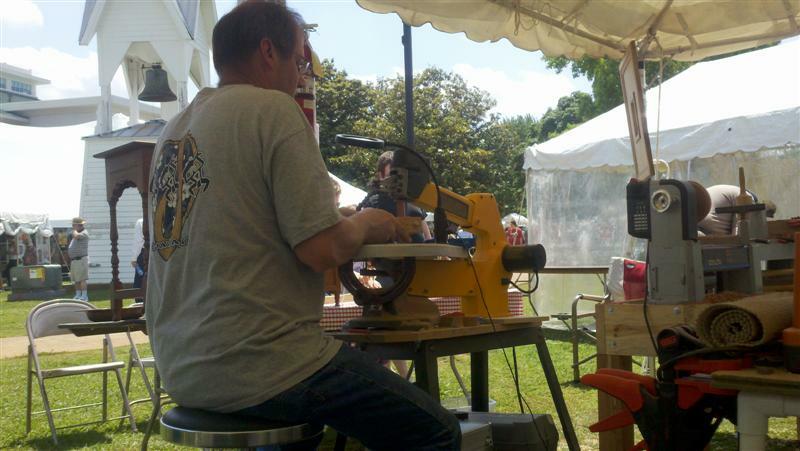 Work safely and don’t take unnecessary changes with your woodworking tools.